A delegation of twenty participants from the various OECS member states will be attending the final event of Digital Jam 3.0 at the UWI Regional Headquarters, Kingston, Jamaica over the weekend of March 1st and 2nd, 2014. This has been coordinated by the OECS Secretariat through the efforts of the OECS Export Development Unit in Dominica. The unit is seeking to energize the private sector through strategic initiatives like Digital Jam 3.0 which is geared towards the stimulation of employment and entrepreneurship. The central idea is to ensure that technology meets talent in an enabling environment. This is one way to collectively contribute to poverty reduction and shared prosperity in the Economic Union. Bringing together smart young tech entrepreneurs from all over the Caribbean and let creativity do the magic, is one of the objectives of Digital Jam 3.0 "Caribbean edition" previously launched in the OECS in December, 2013 at the Dominica State College. With the goal of contributing to job creation for Caribbean youth, Digital Jam 3.0 "Caribbean Edition" is a regional initiative of the Government of Jamaica and the World Bank that challenges Caribbean youth to embrace the endless opportunities provided by ICT - Information and Communication Technologies. Whether developing Apps for delivering services through tablets and smartphones or working remotely using microwork and e-lancing platform, it is clear that ICT have connected the Caribbean to the world, making global opportunities accessible like never before. Your location or the size of your town don't matter, your computer is the gate to the world. Over the past three months, several activities have been held within the OECS commencing from the launch of the initiative in Dominica on December 1st, 2013. Follow-up activities included a Mentorship exercise for the shortlisted OECS teams undertaken at the Dominica State College and via Skype video conferencing on Wednesday 29th and Thursday 30th January 2014, with support from a team of experts retained by the World Bank. The teams got the chance to meet one on one with the mentors who engaged them in discussions on the concepts for their apps development as well as the business aspect of having their apps available worldwide to the general public after the competition. 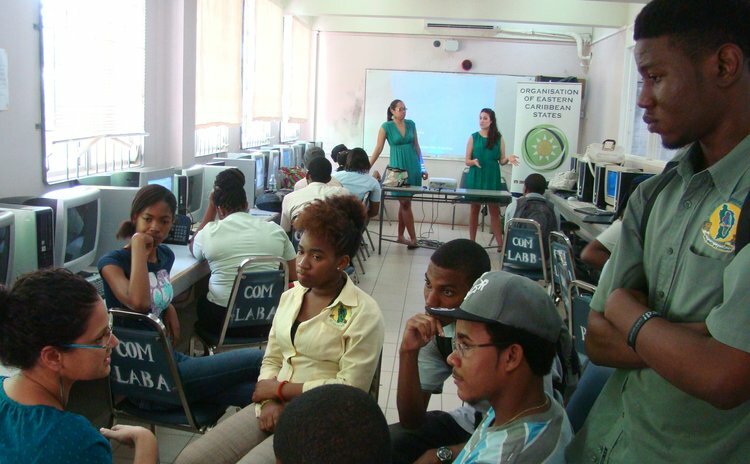 Between February 6th and 12th, public awareness and training sessions were conducted in Dominica, Barbados, Grenada and St Kitts & Nevis in online work opportunities for OECS nationals through two sponsor platforms of Digital Jam 3.0, CrowdFlower.com and MobileWorks.com. Funding for the participation of the OECS delegation was made possible by the assistance of the Caribbean Development Bank and the World Bank. Digital Jam 3.0 will climax with the Apps competitions, a hackathon, trainings on microwork and e-lancing. It will be an inspirational two day event with global entrepreneurs, leaders and experts discussing entrepreneurship, access to funding, successful pitching and more. Moreover, during the final event the finalist teams of the apps competition will be given the opportunity to present their creations and secure the grand prize of US $10,000.